Mercedes is supporting the German team in the FIFA Womens World Cup football tournament, held in Germany 26 June – 17 July, with a television advertising campaign featuring coach Franz Beckenbauer and members of both the German womens and mens teams. The Gemeinsam Zum Stern (Together to the star) campaign shows Beckenbauer drumming up support for the two-time defending champions in the player’s tunnel, bringing a sense of urgency to a cheer squad led by German superstars such as Bastian Schweinsteiger, Lukas Podolski, Thomas Mueller. The women’s team walks down the tunnel to go onto the field. 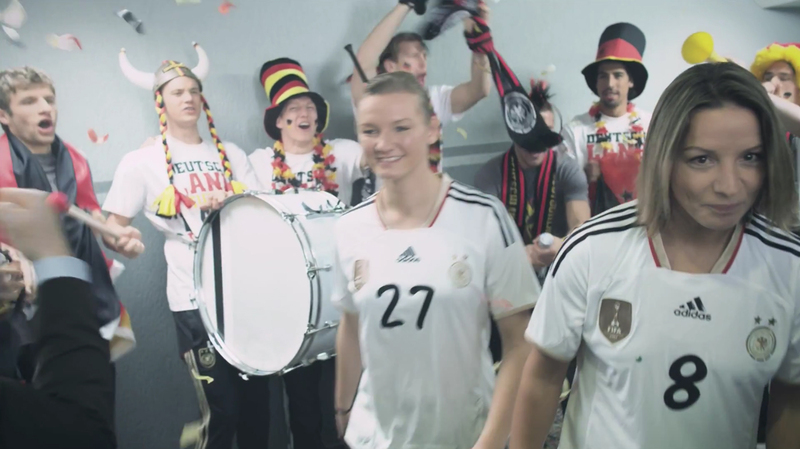 The campaign, online at the GemeinsamZumStern Facebook page, includes a collaborative approach to Germany’s national team anthem. The GemeinsamZumStern campaign was developed at Jung von Matt/Alster, Hamburg. Filming was shot by director Zoran Bihac via Tony Petersen Film with director of photography Ekkehart Pollack. Post production was done at NHB, with composition by MothersMilk. Digital aspects of the campaign were produced at NeulandHerzer. Photography for the print campaign was by photographer Emir Haveric. NASA What Kind of World Do You Want?